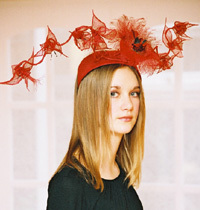 At Bespoke Millinery, Virginie Kan exclusively designs individual hats, fascinators, tiaras and other hair accessories. Every creation is lovingly crafted and hand made to your personal requirements from size, style, colour, materials and trimmings. So no design is ever the same because Bespoke Millinery is about creating millinery just for you. Hats can be commissioned for any occasion. They can be classic and elegant or take on the more quirky and witty. So if you’re looking for a wedding hat, want to make a statement at Ascot or are simply searching for a gem to wear on a whim, contact Virginie who will be happy to create a tailor made hat to suit you. Looking for something special but don’t want a formal hat? If you’re looking for an alternative to a hat, Bespoke Millinery offers fascinators and other hair creations, ideal for weddings, parties and other special events. Creations can be discreet and delicate or flamboyant. They can come in any size, shape and colour. The choice is yours to match your outfit perfectly. For the bride-to-be searching for an exquisite wedding tiara, Bespoke Millinery provides a full bridal service to turn your ideas into a dream. Virginie will work closely with you to come up with a unique design (wedding tiara, crown or hair jewels) to compliment your wedding dress to the last detail. The bridal service also extends to creating chic and elegant hats for the Mother of the Bride and hair accessories for the bridesmaids. For a price guide, please contact Virginie. Small or large commissions are welcome. Millinery creations start from as little as £50. All prices are based on the design and type of materials used for individual commissions.